InternetTraffic selected as top domain parking company. Less than two years after opening his own domain parking platform, domain investor Frank Schilling is at the top of the heap. Participants in Domain Name Wire’s 8th annual industry survey have selected InternetTraffic as the top domain parking service. Data show that the domain parking business is still fragmented. InternetTraffic received 22% of the vote but seven companies received at least 6%. 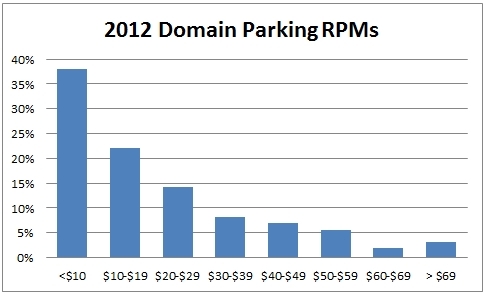 Domain owners continue to report relatively low RPMs on their parked domains. 42% of respondents said their domain parking revenue was down in 2012 compared to the prior year, with 15% reporting a drop of at least half. 29% reported an increase while 28% said it was flat. Domainers aren’t bullish about 2013, either. 34% think parking revenue will go down while only 24% predict an improvement. Frank Schilling sets the stage for 2014. More domain parking revenue? Thanks for sharing the results. I voted for InterTraffic. They are so far the best parking company I have used in the past 5-6 years. i moved all my crappy domains over to internet traffic three months ago. went from thirty cents a day to five dollars a day. that’s money in my pocket man… money in my pocket. Hands down, IT was the right choice, most people do not understand just how much control that platform puts in the hands of a domainer. After using sedo for years, I was selling in the dark, It is nice to have some transparency. Oversee.net is not even on that list. I would love to know how that company makes any money. Sad to see that parked.com is dead and gone. First, DS is big partly because it has its own portfolio of 700k or so domains. Second, they have some big clients. They haven’t been catering to the smaller guys as much as back in the day compared to some of the newer companies. There are fewer “big” clients than “small” ones in the domain industry, so they won’t get as many votes. I see oversee drops all over the place so they are seriously cutting back on their portfolio. I’m sure you know more than me but I would guess they HAD some big clients. One bulk nameserver change and oversee clients are internettraffic.com clients by the end of the day. Oversee.net has cut its portfolio significantly over the past year. I don’t remember the exact number they told me, but it was more like hundreds of thousands rather than tens of thousands. I suspect they had a lot of marginal domains that barely paid their annual fee in PPC revenue each year. Okay. We agree on that point. Now, do you think parking revenue is up or down over the past few years? Also, do you think they have gained or lost customers over the past few years? Any old customers going back to them after trying another parking service? I say no to all of the above. Just saying… I don’t believe they are as big or as profitable as they make themselves appear to be. And a .com company that doesn’t own its domain .com. Always been strange to me. I don’t think they’ve ever said what their profits are. They keep that private. Perhaps it’s your impression of how big they are, which could be formed from any number of things.